The slim, rosy-cheeked mother of four was a devout Tibetan Buddhist, a close relative says. But her visits to the Dzamthang Jonang monastery this spring were out of character. So too were the spiritual mantras Kalkyi had begun to chant several times a day, and the way she had taken to prostrating herself in the monastery at least twice a day. 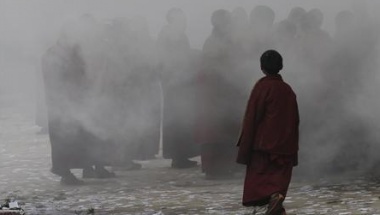 On the chilly afternoon of March 24, Kalkyi - who like some Tibetans went by just one name - stood outside the monastery gates with about 200 to 300 other worshippers. She doused herself with gasoline and lit a match. Flames instantly engulfed her, and as they did, she shouted words that no one could make out. Witnesses say it took less than 15 minutes for the blaze to kill Kalkyi. She was 30 years old.